The one big problem with today's touchscreen technology, as at the end of your fingertips. Screens are prone to smears from fingerprints, as well as other gadget-ey dangers such as pocket fluff, spills, smudges and dust. There are a bunch of solutions on the market, as well as a bunch of old wives tales on how to keep your tech clean. Now, you may think that smearing dollops of Brasso's famous metal polishing liquid on your pricey gadgets is not a good idea - and you'd be right. 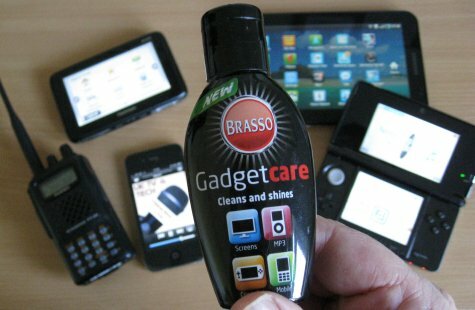 What Brasso's gone and done though, is brought out a nifty gadget-cleaning product called Gadgetcare, aimed at us tech lovers. The claims are that this stuff cleans and protects your tech kit, removing fingerprints , to clean and shine safely. It's good stuff too - we've tried it on our TomTom Sat Nav, the Nintendo 3DS, our iPhone, our digital camera, our portable recording equipment and our laptop. Why's it special? The packaging claims that the "unique formula contains silicone and anti-static properties and removes all fingerprints and smudges". It does a pretty good job of cleaning touchscreens and plastic coatings, and it's currently the FrequencyCast cleaning product of choice. It's even got that great Brasso smell (the packaging lists "Perfume" as an ingredient). Apparently, it has less than 5% polycarboxylates, which we're guessing means something to someone. What's also cool, is that after a clean, it appears to leave a protective layer that makes smudges a little less obvious, and reduces dust-attracting static. It doesn't work miracles, but we did notice an improvement when used on our Galaxy Tab and iPhone for keeping fingerprint smudges under control. The Brasso team were at Gadget Show Live 2011 to promote their GadgetCare product, and we were able to catch up with one of their team to find out a little more about the product. 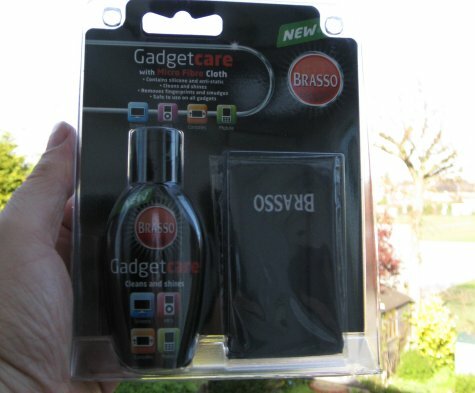 Brasso GadgetCare comes in a 50ml bottle, and the thickish liquid is dropped onto the dirty gadget, and then rubbed down with the provided microfibre cloth.